The club was promptly re-established in August 2002 as Associazione Calcio Fiorentina e Florentia Viola with shoe and leather entrepreneur Diego Della Valle as new owner, and was admitted into Serie C2, the fourth tier of Italian football. The only player to remain at the club in its new incarnation was Angelo Di Livio, whose commitment to club's cause further endeared him to the fans. Helped by Di Livio and 30-goal striker Christian Riganò, the club won its Serie C2 group with considerable ease, which would normally have led to a promotion to Serie C1. However, due to the bizarre Caso Catania (Catania Case) the club skipped Serie C1 and was admitted into Serie B, something that was only made possible by the Italian Football Federation's decision to resolve the Catania situation by increasing the number of teams in Serie B from 20 to 24 and promoting Fiorentina for "sports merits". 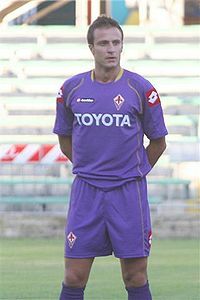 In the 2003 off-season, the club also bought back the right to use the Fiorentina name and the famous shirt design, and re-incorporated itself as ACF Fiorentina. In 2005-06, Fiorentina hired Cesare Prandelli as their new head coach and made several signings during the summer transfer market, most notably Palermo's 20-goal striker Luca Toni and French goalkeeper Sébastien Frey. The combination of captain Dario Dainelli and Czech international regular Tomáš Ujfaluši in defence, Cristian Brocchi as midfield ball winner, Martin Jorgensen on the wing, Stefano Fiore as playmaker and key marksman Toni, with Frey in goal, proved to be an outstanding force in Serie A, giving them a fourth place finish with 74 points and qualifying the team for the third qualifying round of the Champions League. Toni scored 31 goals in just 34 appearances, the first player to pass the 30-goal mark since Antonio Valentin Angelillo in the 1958-59 season, for which he was awarded the European Golden Boot. On 14 July 2006, however, Fiorentina were relegated to Serie B due to their involvement in the 2006 Serie A match fixing scandal and given a 12-point penalty. The team was reinstated to the Serie A on appeal, but with a 19-point penalty for the 2006-07 season. The team's UEFA Champions League place was also rescinded. After the start of the season Fiorentina's penalization was reduced from 19 points to 15 on appeal to the Italian courts. Despite starting the 2006-07 season with a 15-point penalty, Fiorentina nevertheless managed to secure a place in the 2007-08 edition of the UEFA Cup. The combination of Toni and Adrian Mutu proved to be one of Serie A's most proficient strike partnerships, scoring 31 goals between them. While many doubted the potential of the Viola in the 2007-08 season due to Toni's departure, Fiorentina had a sensational start to the season and were tipped by Marcello Lippi and other prominent names in football as a surprise challenger for the Scudetto. 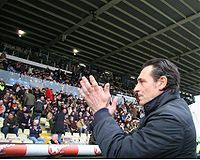 However, this form tailed off towards the middle of the season, with several disappointing losses in connection with a grievous family loss suffered by club manager Prandelli. The club reached the semi-final of the UEFA Cup, where they were ultimately defeated by Rangers on penalties after two 0–0 ties. The season ended on a high note as Fiorentina defeated Torino 1-0 on the final day of the season to secure a UEFA Champions League spot at the expense of AC Milan. That campaign ended in the group stages, however, with the club finishing third and securing a path to the UEFA Cup instead. 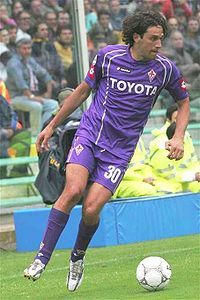 The 2008–09 season continued this success, a fourth place finish assuring Fiorentina's spot in 2010's Champions League playoffs. The Viola also took part to the 2008–09 UEFA Champions League, reaching the group phase after defeating Slavia Prague in the third qualifying round, but the club did not manage to qualify to the knockout rounds and was successively eliminated from the 2008–09 UEFA Cup too. In contrast to their Champions League campaign, La Viola remained in the top tier of the domestic league. A reversal of trends took place in the ongoing 2009-10 season, as the club saw a dip in their Serie A form, yet proved itself to be a surprise dark horse in Europe. Fiorentina started their domestic campaign strongly, trailing leaders Inter along with Juventus and Sampdoria earlier in the season, but steadily lost momentum and slipped to mid-table positions at the latter half of the season. In Europe, the team got past Sporting in the qualifying rounds and drawn a tight group consisting of Lyon, Liverpool and Debrecen. Losing their first away fixture against Lyon, many dismissed their chances of getting through, but the Italians staged a comeback with winning all their remaining matches, which included defeating Liverpool home and away. The Viola qualified as group champions, but eventually succumbed to F.C. Bayern Muenchen due to away goals, in a controversial double encounter involving what was considered as poor refereeing. Tom Henning Øvrebø, who led the first leg in Germany, was then lambasted by journalists and Italian footballing figures for his decisions, most notably allowing a Miroslav Klose offside goal (that eventually fired Bayern through the next round), calling into attention the possible implementation of video replays in football. Fiorentina also maintained a strong Coppa Italia campaign, reaching semifinals and aiming for eventual triumph. During this period, on September 24, 2009, Andrea Della Valle resigned from his position as chairman of ACF Fiorentina, and announced all duties would be temporarily transferred to Mario Cognini, Fiorentina's vice president until a permanent position could be filled. On 26 October 2009, Andrea Della Valle stepped down as chairman. The position is now vacant. Luca Toni breaking record by scoring 31 goals in Single Serie A season. Alberto Gilardino, current star of the club.